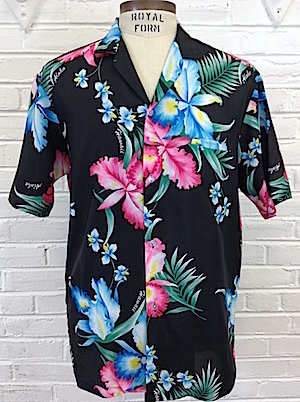 Classic vintage mens Hawaiian shirt! 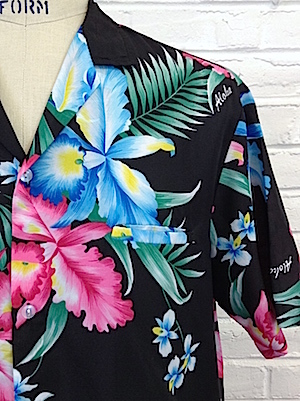 Black base with large and bright blue and magenta hibiscus flowers! on the sides of the flowers the Hawaii is written in white. Closes in the front with clear buttons. Has one chest pockets and a straight hem. Tagged by Royal Creations. No material tag, but feels like polyester or a polyester blend. Condition: Good++: Has a cigarette burn in the lower right front of the shirt. Still a great shirt. priced accordingly!